The city that resisted Franco is looking to its radical past to build a progressive future. Barcelona, Spain—“When we moved into city hall, there were only paintings by men,” Barcelona Mayor Ada Colau tweeted in March, attaching a picture of her current office wall, which now featured portraits of eight prominent Catalan women—including the legendary anarchist leader Federica Montseny. “Redecorating the walls, that was the easy change,” Colau’s second in command, Gerardo Pisarello, joked when we spoke with him in late June. “The other ones take quite a bit longer—they are more difficult and don’t just depend on us.” Pisarello’s office, too, features black-and-white photographs: one of a woman celebrating the proclamation of Spain’s Second Republic in 1931, and another taken at the country’s first LGBT protest after dictator Francisco Franco’s death in 1975, a demonstration that, as Pisarello proudly points out, happened in Barcelona. Colau and her team were unexpectedly swept into the mayor’s office in May 2015. Barcelona en Comú (“Barcelona in Common”), the progressive political platform Colau and others founded less than a year before the elections, won by the narrowest of margins, with a mere 11 of the 41 seats in the city’s council. It was just enough to form a minority government. Still, the BeC platform—a coalition that includes the Catalan branch of Spain’s new anti-austerity party Podemos, the United Left, and the Catalan Green Party—has faced a difficult challenge. Their aspiration is not just to alleviate the severe social and economic consequences of the Great Recession. They also want to reinvent how city government functions, from the ground up. Yet that, precisely, is BeC’s goal. For BeC, grassroots participation is fundamental. Drawing on a long-standing tradition of powerful residents’ associations, the party has organized itself according to Barcelona’s neighborhood-oriented map—each neighborhood runs its own local assembly—and tries to appeal to an array of people, not just the college-age, activist population with which they’re often associated. In Barcelona, Roth says, many no longer identify with the logic of the traditional left, which is often structured around specific social movements, labor unions, and political parties. Ciutat Vella (“Old City”) is a textbook case. The district demographics skew to an older generation, which often comes from a wealthier background and shares different interests than the party’s core of young activists. Yet, Roth says, people in the district often agree on key issues plaguing the city, such as the uncontrolled growth of tourism. With a population of 1.6 million, Barcelona is the second-largest city in Spain, and the eleventh largest in the European Union. It is also the capital of Catalonia, an autonomous region that has recently declared its intention to pursue independence. Although it has long been among the more prosperous of Spain’s cities, the Great Recession and the austerity policies imposed by Brussels and Madrid, and endorsed by the conservative parties dominating the Catalan government, have pushed social inequality in Barcelona to alarming levels. The most recent data on family income, covering 2014, show increasingly stark differences among neighborhoods, with the average income in upscale Pedralbes—where Spain’s king’s sister and her husband used to own a home—now at more than seven times that in Trinitat Nova, whose crumbling, cheaply built 1950s high rises mostly house the working class and immigrants. Life expectancy in the city’s poorest neighborhoods is 11 years below that in the richest areas, and unemployment is twice as high. In 2014, more than 3,000 families in the city lost their homes because they couldn’t pay the rent or mortgage. As soon as they entered city hall, Colau and her team took a series of emergency measures to alleviate the crisis, expanding free school-lunch programs and public day-care slots while cracking down on housing speculation and increasing the availability of rent-controlled apartments. But their ambitions are also structural. In January, Colau announced a $165 million plan to reverse the rising tide of inequality by investing in employment, education, and housing in the city’s poorest neighborhoods. As in all its programs, the BeC government aims to hit many birds with one stone: to shift the focus from the haves to the have-nots, from large multinational corporations to local businesses, from the capitalist economy to cooperative structures, and from carbon-based energy to renewables. BeC’s bet on green energy and sustainability is among the most aggressive of European cities. In July, Colau announced that the city would create its own solar energy company to buy and sell electricity produced in the city. The initiative is meant to encourage residents and companies to install solar panels while taking an important first step toward the de-privatization or “remunicipalization” of basic goods and services, following the example of cities in France and other countries. BeC is also pushing to take back public control over the water supply in the Barcelona metropolitan area, which is now in the hands of Agbar, a for-profit public-private partnership tainted by corruption. The underlying idea is simple: residents should not have to depend on for-profit corporations for their basic needs. Improving residents’ quality of life—and the quality of democracy—by strengthening the city’s communal fabric is also at the heart of Colau’s support for an ambitious urban renewal and mobility plan that has grabbed international headlines. Initially conceived in 1987, the plan aims to create “superblocks” (superilles in Catalan)—units larger than a single block but smaller than a neighborhood—in which motorized traffic would be minimized, turning pavement and intersections into green or community space. Barcelona has long exceeded the recommended limits for air and noise pollution, while the amount of green space per inhabitant is just over 70 square feet (more than 13 times less than Amsterdam). The plan will be implemented gradually, with plenty of opportunity for feedback and adjustment. For the next two years, the goal is to reduce car traffic by a fifth while increasing mobility by foot, public transport, and bicycle. But Barcelona residents are annoyed by more than dirty air, noisy streets, and a dearth of parks. Chief among the population’s grievances is the unrelenting tourist boom that is a major pillar of Barcelona’s economy but has made large parts of the city unaffordable for many and unlivable for most. Ten minutes into the 2014 documentary Bye Bye Barcelona, by Eduardo Chibás, viewers are presented with a startling statistic: Whereas in 1990 the city attracted 1.7 million tourists per year (roughly the size of Barcelona itself), by 2013 the wayfaring flood had swelled to more than 8 million annually. The city has been turned into a theme park, many interviewees in the documentary say. Whole neighborhoods have been taken over by hotels, lucrative tourist apartments, and Airbnb rentals that are artificially inflating real-estate prices and rapidly displacing the resident population. Previous city governments did little to curb this trend. To the contrary, some stoked it. But soon after entering office, Colau declared a controversial moratorium on hotel licenses and construction, arguing that the city first needed to draft a plan for sustainable development before allowing any further growth. However, curbing the spread of tourist apartments is a more challenging proposition. Simona Levi, an Italian theater director and activist who has lived in Barcelona since 1990, underscores the complicated nature of the situation. A resident herself of Ciutat Vella, she cites the example of the person who has inherited her grandmother’s apartment and now rents it to tourists. For many people, such as the unemployed or temporarily employed, this may be their only source of income, she says. Although new tourist complexes in the center of Barcelona are illegal, “if the apartment that your grandmother left you happens to be in the center and you’re counting on that income over the next few years, it puts you in a terrible situation. The new governing left-wing parties and coalitions need to understand this nuance,” Levi says. Colau is critical of the machismo evident in some of Podemos’s most visible spokespeople. Hers, she told Hancox, is a feminized politics that steers clear of old-left rhetoric and aggression. All her abilities were on display this summer during the opening rally for the campaign for the June 26 elections. Lucía Martín, a co-founder with Colau of PAH and a member of parliament for En Comú Podem (“Together We Can”), the Catalonia-wide version of BeC, was speaking to a crowd of thousands when, suddenly, someone fell from a post. Martín got flustered. Colau quickly took the initiative. She stepped in next to Martín and calmly spoke into the mic to call for an ambulance. She then gave Martín a kiss to calm her down. Charisma, composure, and humanity—the attributes that informed Colau’s ability to take hold of the situation here are also the ones that have given her one of the highest approval ratings in all of Spain: 64 percent. The BeC government aims to shift the focus from the haves to the have-nots. Pisarello, a professor of constitutional law at the University of Barcelona, was born and raised in Argentina, where his father was a desaparecido (“disappeared”) during the dictatorship. He moved to Barcelona in 2001 and has long been active in the defense of civil and constitutional rights. Moving from the world of activism to City Hall was something of a shock, he recalls. BeC, like other parties with roots in the 2011 indignados movement, feels genuinely ambivalent about institutional politics. Like many activists, they have learned to distrust institutions almost by default. This is why they take every opportunity to make clear that they are not, and never will be, regular politicians. The media campaigns against them, on the other hand, have taken pains to prove that they are. Representatives of BeC, like all parties associated with Podemos, have voluntarily capped their salaries at three times the minimum wage, donating the remainder to the party for investment in social programs. The gesture is largely symbolic—but symbolism is important when the electorate’s faith in politics and politicians are at historic lows. The same goes for the pictures of prominent women on Colau’s and Pisarello’s office walls. For any politician in Spain to claim a genealogical connection with the Second Republic and the left of the 1930s is a bold political statement. Since transitioning to democracy in the late 1970s, the country’s establishment has been reluctant to identify with any movement from that era. In fact, Spain’s post-Franco democracy—a parliamentary monarchy—was expressly designed not to resemble the ill-fated Republic. Franco’s dictatorship (1939–75) spent four decades painting the Second Republic as a political disaster that caused the outbreak of the Civil War in 1936, a narrative that conveniently masked the fact the war was started by a right-wing military coup. Yet Colau and Pisarello see the Republic’s ideals and achievements as a source of pride and inspiration—much as they also see the population’s unexpected resistance to the coup, which was particularly strong in Barcelona, as a history that deserves to be celebrated. This past July 18, on the 80th anniversary of the war’s outbreak, Colau’s government issued an unprecedented proclamation titled Volem la pau, però no l’oblit (“We Want Peace, but Won’t Forget”), lamenting all deaths that occurred as a result of the military uprising, while honoring the men and women who rose up to defend democracy. The government also made a point of acknowledging the population’s struggle for Catalan autonomy, women’s rights, and workers’ self-government, while recalling that Barcelona opened its doors to hundreds of thousands of refugees from the rest of Spain. Tellingly, the city referred to the three-year conflict that ended in 1939 with the victory of Franco as “war and revolution,” acknowledging that Barcelona workers responded to the coup by organizing what historian Chris Ealham has called “the greatest revolutionary festival in the history of contemporary Europe.” Three days after the coup, local committees associated with the anarchist union CNT proceeded to collectivize factories, businesses, and estates. BeC’s historical memory of activism, though, also taps into much more recent struggles. Colau points to the anti-globalization movement of the early 2000s as her political awakening. Others recall the alternative economies set up in response to the Great Recession, including time banks, urban gardens, and cooperatives. (As a way of addressing capital flight from tourism, Colau’s government has proposed a local currency for Barcelona; the plan is still in its early stages.) Barcelona also has a strong tradition of militant neighborhood organizations that serve to unite different progressive sensibilities, from the radical left to liberal Catholics. “In our first year we have relied on social movements not just for support but also for the expertise they have developed over many years of building alternatives,” Pisarello told us. He, Colau, and others in BeC often publicly state that they especially welcome criticism from social movements and activists. “Some of that is political rhetoric,” Ealham, the historian, says. “I’m not sure they really want the street pressure.” The movements appear to have taken the invitation seriously, however. For many others, the change is too slow and not straightforward enough. In addition to the issues highlighted by PAH, a drawn-out deadlock over a collective bargaining agreement with subway-worker unions—the largest of which is the anarchist CGT—has led to strikes and slowdowns. Perhaps most illustrative of the city’s challenges is the crisis around street vendors: hundreds of mostly African immigrants—called manteros for the blankets (mantas) on which they spread out their wares—who barely eke out a living selling counterfeit goods. Colau was determined to break with the previous administration’s repressive approach: sending police to chase the manteros—who quickly wrap up their blankets with the pull of a string—from one plaza to the next. 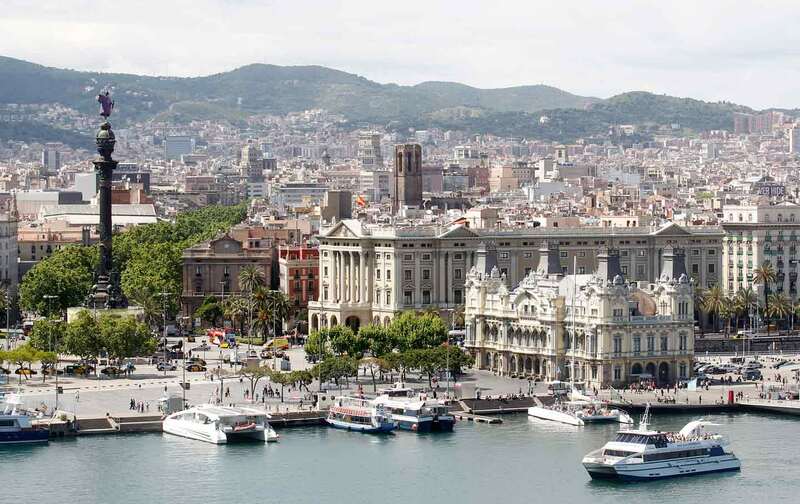 The new administration instead implemented a program offering a limited number of street vendors alternative employment, while tolerating vending activity in particular zones of the city, such as the Passeig Joan de Borbó bordering the luxury-yacht harbor in La Barceloneta. On a sunny afternoon in late June, the avenue was lined with some 500 vendors selling sunglasses, running shoes, and soccer jerseys. Only a handful of tourists bothered to stop and take a look. By the end of the month, the number of vendors had grown to 800. Pisarello, the deputy mayor, held a tense meeting recently with local shop and business owners who wanted the vendors gone. In response, he announced a stricter enforcement of laws against illegal buying and selling. Meanwhile, tension has mounted between the city and the manteros union, which has protested the city’s campaign to discourage tourists and residents from buying counterfeit brands. Opposition parties from both left and right have denounced the city’s approach as naive and ineffective. BeC’s municipalismo is built on the notion that city-level government can be more effective and democratic than state or national government. “After eight years of crisis and seven of austerity, the old slogan ‘Think globally, act locally’ reflects the new relevance of cities as agents of change,” Laia Ortiz, a councilwoman, says. “At a moment when popular sovereignty is being blurred everywhere, cities can take on an important role in the reconstruction of democracy.” But the unrelenting stream of street vendors are a snapshot of global inequalities, whose solution lies outside the reach of any one city. Colau pushed for cities to have a stronger voice in state-level decision making at the United Nations in May. Taking the refugee crisis as an example, she said, “We are deeply ashamed. If Europe wants to keep its status as a beacon of human rights and democracy, it has to radically change its policies. As cities we are ready to help and comply with our obligations toward the refugees and asylum seekers…but they won’t let us.” Colau will travel to Quito, Ecuador, in October for the Habitat III conference, formerly known as the UN Conference on Housing and Sustainable Urban Development. She has called it an “historic opportunity” to empower city governments to tackle the world’s toughest problems. While Spain’s national parliament finds itself in a stalemate after the second election in six months has not yet yielded a viable coalition and the EU is facing its deepest economic and migration crisis since its founding, it’s hard not to agree. An earlier version of this article stated that Spain’s king and queen used to own a home in the neighborhood of Pedralbes. It was the king’s sister, Infanta Cristina, and her husband. The piece has been updated.